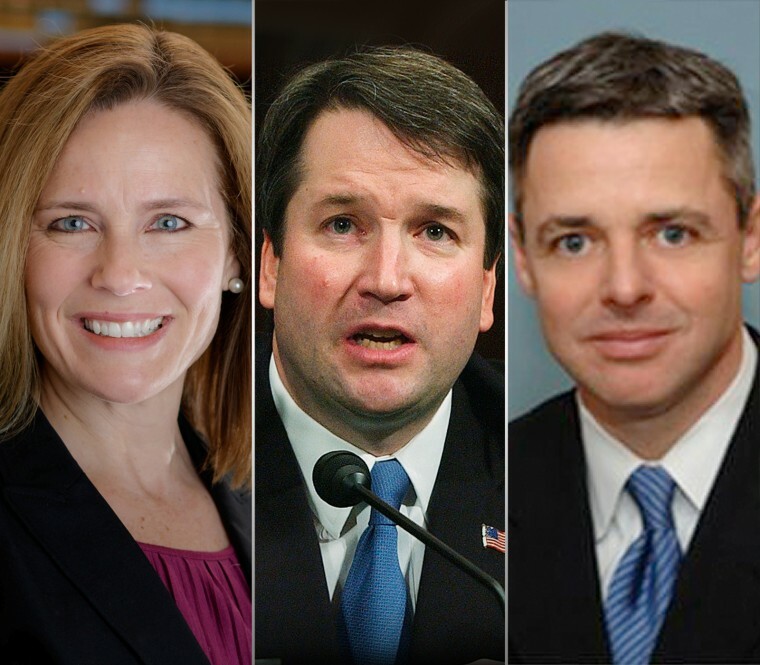 Those candidates are appeals court judges Brett Kavanaugh, Raymond Kethledge and Amy Coney Barrett, a source tells NBC News. Kethledge currently serves on the 6th Circuit Court of Appeals. Barrett, 46, is a former law clerk to Scalia and was appointed by Trump last year to serve on the 7th Circuit Court of Appeals. Barrett, if selected and confirmed, would be the youngest justice on the high court. Kennedy, a reliable swing vote on the nine-member court, announced his retirement in late June. Over the past week, the president interviewed several candidates and promised that his pick would be a "home run." With Kennedy's departure from the court, Democrats and liberal-leaning groups are gearing up for a major confirmation fight, arguing that a potential pick should be selected and confirmed after the midterm elections in November. CORRECTION (July 5, 3:20 p.m.): An earlier version of this article misstated where Judge Raymond Kethledge, one of the top candidates for a Supreme Court appointment, attended law school. It was the University of Michigan Law School, not Yale Law School.